I've written a fair amount on here about my experiences as a professional chemist. Over the past (almost) decade, my career has taken me in directions I never could have guessed back when I was in graduate school working toward my doctorate. As I briefly mentioned on here a month ago, the latest twist was one I never hoped to ever find myself experiencing: laid off. Now that the dust has settled, my head has cleared, and I'm knee deep in finding my next opportunity, I thought it would be a good time for an update. I also thought it would be A) a bit therapeutic for me to write about it, and B) a service to other professionals, scientists or otherwise, who might find themselves in a similar situation as a way to impart whatever scraps of insight I've gained from the whole thing. Where to start? The day I was let go, I was in the middle of a web conference with colleagues from another one of my company's locations when my boss' boss came to my desk and asked if I had a minute. I followed him to his office, thinking it was our routine end-of-year meeting (we always have these in October/November) but as soon as I saw someone from HR sitting in there waiting for me, I knew immediately what was coming. They went through all of the details of why the company was eliminating my position, what my benefits would be, that it wasn't performance related, etc. Looking back on it, I handled it much better than I would've guessed beforehand. After a quick goodbye, I grabbed my keys, jacket, and headed home. I called my wife on the way to let her know what happened, we told our kids, and I finally sat down and exhaled. I told myself in that moment that, since it was a Thursday, I'd give myself the weekend to relax and then hit the ground running on Monday to start look for a new job. As the day went on, though, my initial feelings of handling it well gave way to an almost depression over the fact that my job, my coworkers (many of whom became friends), my daily routine, all of it was yanked away and gone in an instant. The typical thoughts started popping up...was I not good enough? They said it wasn't performance based, but maybe it was? That slowly gave way to a seething anger over the weekend...not at the company or anyone in particular, but just at the situation in general. Unfortunately, it spilled over a bit and I took a little bit of it out on my family, but I'm lucky that they were understanding enough to not take it personally. When the first Monday in I-don't-know-how-many-years that I didn't have to go to work rolled around, I was filled with a mixture of dread and anxiety. How was I going to find a job? We've all heard that saying that "it's easier to find a job when you have a job," and any time in the past when I'd been actively looking for a new job, I'd never found one. Both times I moved on from one job to the next, the opportunities found *me* via headhunters or personal friends/contacts. Now I had no job and I had to find one on my own. It wasn't a panicky situation since, as part of my termination, I did get several months severance benefits, but the thought stayed in the back of my mind: now I have a hard deadline where I have to find a job or else. Going by the thought that it's all about who you know (and this is where I'm hoping to share a little bit of new insight) I first reached out to all of my friends and former colleagues who I know personally and asked them to let me know if there were any openings at their companies where they could help me get a foot in through the back door. I've been going the traditional route as well because let's face it, out of the thousands of applicants for these positions, it obviously has to work for someone, somewhere, right?. It's like playing the lottery, and with odds about as good, but it doesn't hurt to try, I suppose. I've been finding, however, that I get a better response when I use networking. Sometimes this entails reaching out to my friends, former colleagues, and other people I know, but a huge part of it has been finding hiring managers and contacting them directly. At this point, I've had several phone interviews, am waiting for calls from people who have told me they're interested, and I've even had an on-site interview. This is a tough time of year to look for a job for a couple of reasons: first, with Thanksgiving, Christmas, and New Year's all crammed within a month of each other, so many people take time off for vacation that companies are closed and the people who I'm waiting to hear back from are out of the office for days or weeks; and second, with the end of the year fast approaching, most companies avoid spending money until their books clear and their budgets renew in January. Even companies whose fiscal years don't run concurrent with the calendar year usually wait until their next quarter begins in January before spending money and hiring anyone new. As it stands right now, I'm kind of in a wait-and-see mode...I'm waiting to hear back from the people I've already been speaking with and most companies are not posting any new openings until the beginning of 2017. While I know that in the grand scheme of things this lay off will be a mere bump in the road that is my life, right now it's a fairly stressful and irritating circumstance. Having finally bought a house within the last couple of years, settled into our neighborhood, and made really good friends, being unexpectedly laid off completely disrupted our life. I was becoming established at my job and had a good reputation as someone who was very knowledgeable, did quality work, and was dependable; now I need to start all over somewhere else and reestablish that again. Our kids had made some really good friends, had settled into their sports teams and after school activities, and were finally okay with the move away from our home are of New England; now they'll have to start over again wherever we end up. We love our house...we've settled in nicely and have been making it our own, changing it around the way we want it, but now we'll most likely need to sell it and find a new house to buy elsewhere. In so many ways, this situation has thrown a huge spanner into the works and while I know that in a year, let alone in five, ten, or more years we'll look back on this as a minor inconvenience, right now it's very real and very much a nuisance. Anyway, that's where things stand with me as a professional chemist right now. Once there's been a substantial new development in my situation, I'll be sure to write about it here in order to share any insight or information I've learned along the way to try and help my fellow chemists/scientists/professionals who may be going through the same thing. For anyone reading this, in any field, and especially chemists specifically: have you been in this situation? How long were you between jobs, and what methods did you find worked the best (and worst) in your job search? Please share in the comments below and let's discuss and help each other out! A while ago, I reviewed Alice Echols' fantastic and comprehensive biography of the legendary Janis Joplin, Scars of Sweet Paradise. 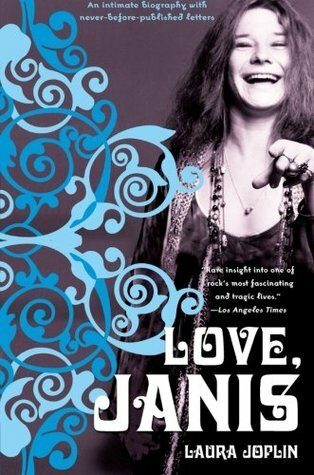 Extensively researched, well written, and clearly by an admirer of Janis (but one who wasn't afraid to cast a critical eye), I declared it the definitive book on Janis. Around the same time that I bought that book, I also bought Love, Janis, written by Janis' younger sister Laura and one I had heard good things about several years ago. Based on what I could glean from the back cover and blurbs I'd read online, Laura wrote a biography of her sister's entire life and included many unpublished letters Janis had written over the years. Armed with that bit of information, and expecting an obviously much more personal look at Janis' life, I dove into it not quite knowing what to expect but looking forward to it just the same. Laura Joplin is six years younger than Janis, but was close to her famous older sister and thus writes from a definite position of love and affection. She starts off the book by tracing the family history on both their father's and mother's sides all the way back to the time of the Mayflower. Tracing the family's journey, the Joplins finally end up in Port Arthur, Texas, where Janis came into the world as the eldest child of Seth and Dorothy Joplin in January 1943. Born into an intellectual and creative family (Seth was a voracious reader, while Dorothy was a former singer and dancer), from the very beginning of her life Janis never quite fit in with the conservative, straight-laced society surrounding her. This was exacerbated by the Texas of the 1950s and 60s that she grew up in. Janis was a very intelligent and creative girl, especially when it came to art; she was a talented painter and even won some awards for her work as a child. What was surprising to me, especially when reading about Janis' pre-fame years, is how Laura told of a girl who was much more popular and had many more friends than has commonly been portrayed. While Janis did have her share of awkward moments and typical teenage growing pains, and certainly rubbed against the grain of her town's culture (most notably in her denouncing of segregation and racism), Laura portrays her adolescence in a much different light from how Echols did. Indeed, a common thread running throughout the book and one that became obvious to me right away was how Laura Joplin's telling of Janis' story was much kinder, gentler, and almost apologetic when compared to the analytical and researched tone of Echols. A huge part of this is obviously down to Laura being Janis' sister and having witnessed so much of her life and career firsthand, while Echols had to rely on research, hearsay, and second-hand recollections from Janis' friends and family many years after the fact. It did seem though, in spots, that Laura was almost going too far the other way to counteract what she thought was unfair or incorrect in how Echols and countless others have written about Janis' younger days. This was most clearly seen in how she treated their parents: while Echols and others painted them as cold, uncaring, and not at all understanding of Janis, Laura tries to show them as warm, loving, and wholly supportive toward Janis. The truth, as usual, almost certainly lies somewhere in the middle. While I don't question that they loved their oldest daughter and did what they could for her, I also don't doubt that they grew to be exasperated, upset, and at some point they probably threw their hands in the air and gave up upon realizing there was nothing they could do to change her. Laura traces Janis' life through high school and her numerous forays into college as a beatnik art student, which ran parallel alongside the development of her love of folk and blues music. Sneaking across the state line into Louisiana to hear authentic black blues and folk musicians, Janis began performing and writing her own music around Texas and developed her voice. She eventually made her way to Los Angeles and San Francisco in the early 1960s, a stint that nearly ended in disaster when she arrived back home in Texas emaciated and strung out after becoming addicted to shooting speed. The arrival back home in Texas coincided with Janis wanting to cast off her more bohemian, beatnik attitudes and try to fit into straight society...she even swore off performing during this time. However, while she was successful at this for a short time, it was clear she was forcing it. Precipitated by a break-up with a con-man fiance of hers (Peter de Blanc), whose deception she eventually sussed out, she fell back into performing and finally began making a name for herself in Texas. Eventually, she hooked up with Chet Helms, who took her to San Francisco in 1966 to audition for a band his Family Dog productions managed called Big Brother and the Holding Company. The rest, as they say, was history. Laura does a nice job tracing Janis' career as Big Brother made their way out of the crowded San Francisco rock scene to become one of the leading lights of West Coast American rock in the late 1960s. However, after her meteoric rise following the launching pad of the Monterey Pop Festival, friction within Big Brother led Janis to go solo at the end of 1968. After getting off to a rocky start in early 1969, her new band settled down and even headlined Woodstock. By the beginning of 1970, drug use and insecurity were taking their toll on Janis' psyche, as well as her penchant to fall head-over-heels in love with the men she was dating after only knowing them a very short time. She also created her alter-ego Pearl around this time, which struck some as bizarre and gave further evidence to many around her that Janis was letting fame detach her from reality. By Laura's account, though, 1970 and her final band, the Full Tilt Boogie Band, gave her some of the happiest times of her life and career. Her final album, Pearl, saw her feeling relaxed and creatively free, but for reasons that her family and friends still haven't been able to fully comprehend to this day, true happiness and contentment still eluded her. A semi-disastrous appearance at her ten-year high school reunion and her continued dabbling in heroin depressed and subdued her as summer turned to autumn in 1970. It was a fatal and accidental overdose of ultra-pure heroin that took her and the music world by surprise when she died at the age of 27 only a mere two and a half weeks after Jimi Hendrix. Even knowing the ending beforehand, it was sad to read her sister describe Janis' final weeks and days, even more so when Janis' letters home were used to flesh out the narrative. It's these letters that make the entire book so compelling. Spanning the entirety of her life after she left home at eighteen, and covering the days when she was in college but not yet famous to the height of her stardom, the letters do the ultimate job of humanizing and personalizing (in the literal sense of the word) Janis Joplin. More than anything, they show her as she really was: just a girl from a small-town in Texas who marched to the beat of her own drum, believed in herself yet was paradoxically insecure, and was for the most part as unprepared and incredulous at the hoopla surrounding her as her own family was. Laura Joplin also does an excellent and rather poignant job of showing how, even during the tumultuous changes of the 1960s, she, her brother, and their parents never fit into Janis world and could never understand the counterculture in which Janis was among those at the epicenter. While Alice Echols' book was excellent in the way it went into real depth regarding Janis' life, career, and how they fit into the context of the 1960s, Laura Joplin's book brings Janis down to earth and softens her in a way only someone who knew her as a family member could. While Laura does dispel some myths there are many cases where, as I mentioned above, she seems to overcompensate in the other direction to make certain events come across better than they probably were. This was most notable not only with how she portrayed their parents, but also how she downplayed Janis' sexual promiscuity (especially her lesbian affairs) and her drug use. This seemed a bit strange because it's been pretty well researched and corroborated how she behaved in those aspects of her life. However, in a way it's perhaps understandable as I can imagine those would be painful subjects for a sister to write about so critically and candidly. Apart from these and her strange tendency to describe every male friend or love interest of Janis' as though she were writing for a dating website ("he was six foot two, ruggedly handsome with tawny brown curly hair, a strong jawline, and broad shoulders"), Laura Joplin crafted a book that, while not necessarily the definitive biography of Janis (I still think Echols' book takes that honor), is still worthy and essential. It's one that I would suggest, along with Scars of Sweet Paradise, as necessary in order to get the most complete idea of who Janis Joplin really was.